Professional educators, both traditional and non-traditional, play an incredibly important role in increasing public awareness and knowledge of environmental issues to a critical audience -- our youth. 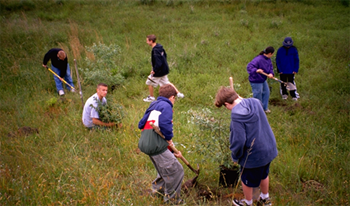 Through environmental education, students of all ages throughout the Barnegat Bay watershed and beyond gain an understanding of how their individual actions affect the environment, learn what they can do to make a positive impact, and become better equipped to spread that message to others. There are numerous resources for educators teaching their students about the Barnegat Bay estuary and its watershed. If you don’t find what you’re looking for here, or know of a new resource or opportunity for educators who want to incorporate information about the natural world into their lessons, please contact the Barnegat Bay Partnersip. This comprehensive booklet (updated version available for download) was created as your one-stop guide for all educational resources related to Barnegat Bay watershed education. What began as a simple directory has grown into a compendium of resources and organizations offering numerous programs, publications, field trips, and watershed information that educators can incorporate into their lessons and activities. In additon to the Barnegat Bay Environmental Resource Guide, you may also browse our list of local and regional environmental education resources.